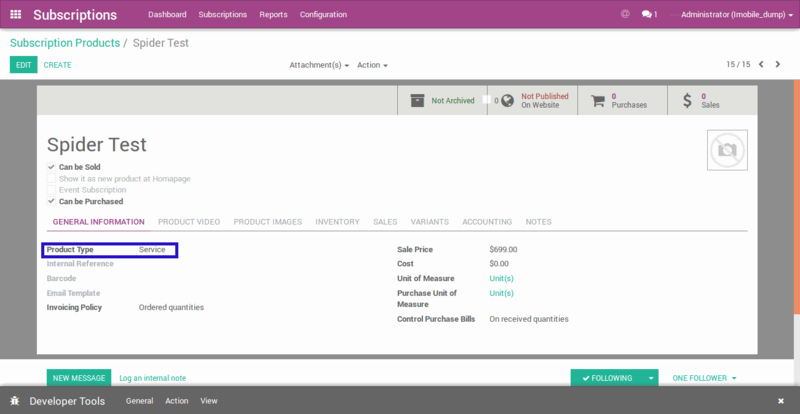 AllClients Provides simple web CRM, contract management an marketing automation in one. Creation of Subscription with specific services with AllClients. 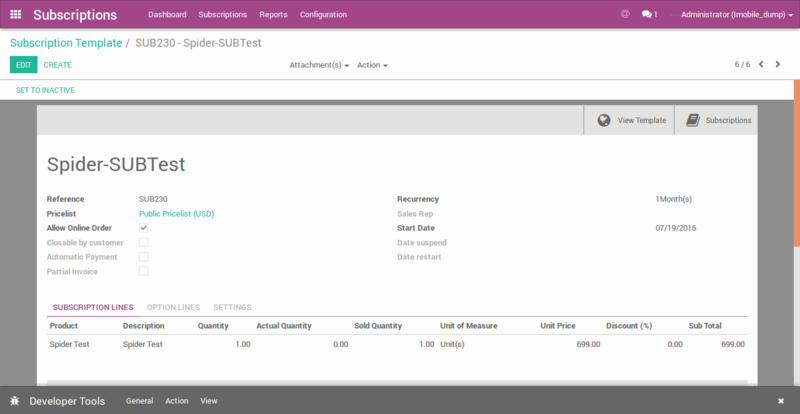 Create Invoice for First Subscription for subscribed service. AllClients account is updated based on subscribed service changes. There are two main services for Spider. Above services are created based on the internal functionality of AllClients Integration. 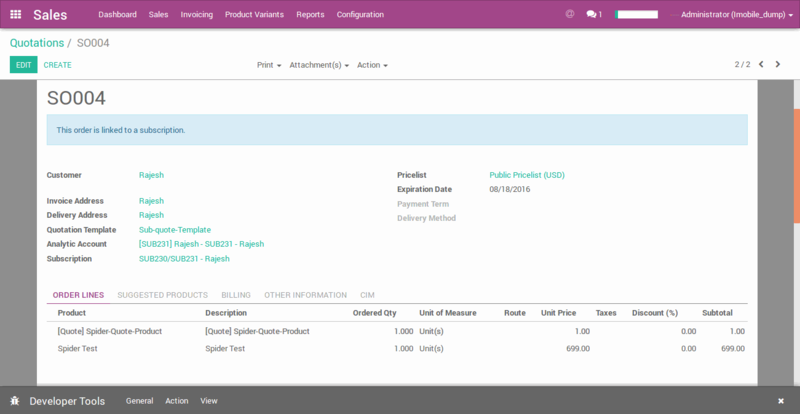 Like subscription is created with product code “SpiderProRE” then customer subscribed for SpiderPro Real Estate. subscription is created with product code “SpiderProMort” then its subscribed for Spider Pro Mortgage. AllClients have a configuration for the group as services. It needs to configure in AllClients. There is subscription Template created and customer with all details mainly email address. 1. in image customer subscribed for the Spider Pro-Real Estate service. When subscription set to in-progress state and Generate Invoice then AllClients account is created for that customer and login credential sent to that customer via email to given email address of that customer. 2. From that email user can access his/her Allclients accounts. 3. Now when user Login with that credential, user can see full profile in own account,which product and id with his account. 4. Now after monthly subscription is over. And user want to subscribeother service. 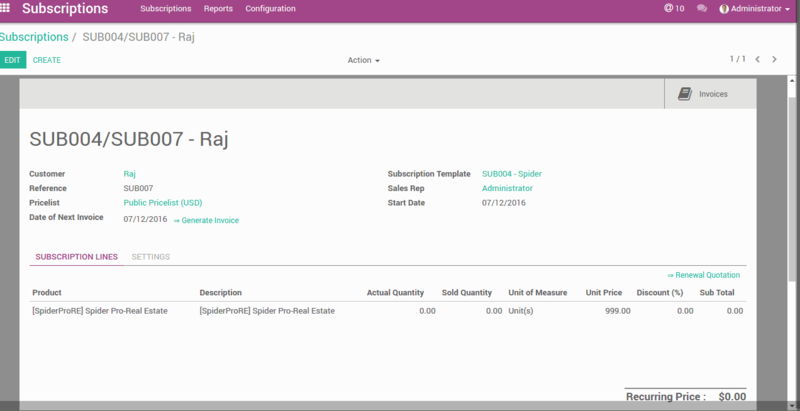 user can update service from Odoo subscription and it will change product in Allclients account.Suppose user change the service to Spider ProMortgage from Spider Pro-Real Estate. 5. Then it will change in Allclientsaccout for that customer with selected service. In subscription user changes service to spider pro mortgage, it updates here with Tarantula for Mortgage. 1. Create Subscription product from Subscription App. 2. Make sure the product type is service. 3. 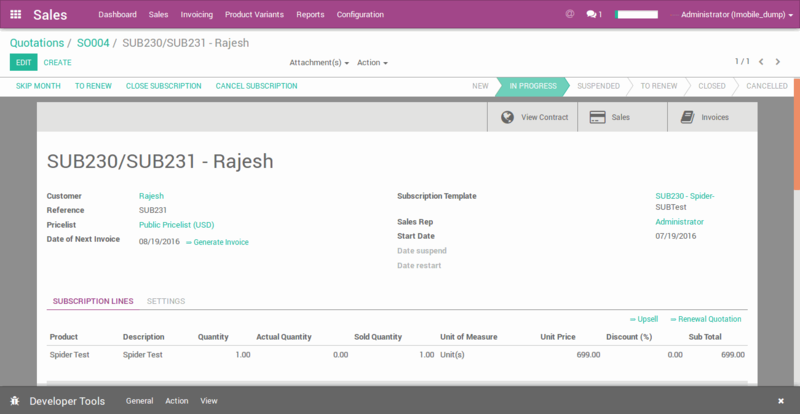 Now create subscription template and select that subscription product in line and set that template to active. 4. 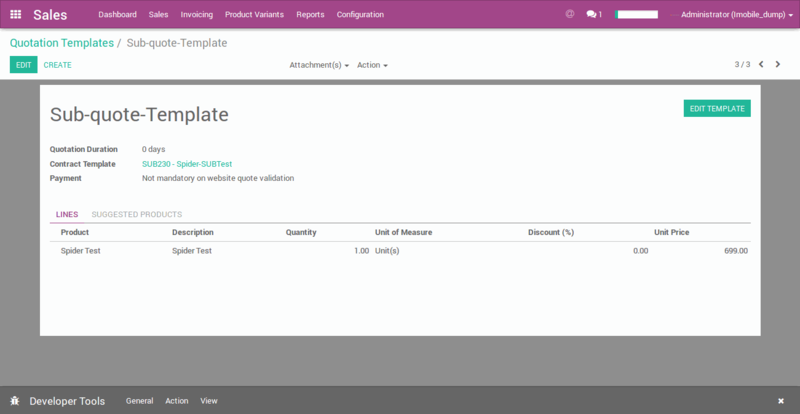 Now Goto Sales > Configuration > Settings > Sales > Quotation Templates and create 1 template. 5. when you create Quotation Template , assign contract template/ subscription Template in that which we already created. 6. 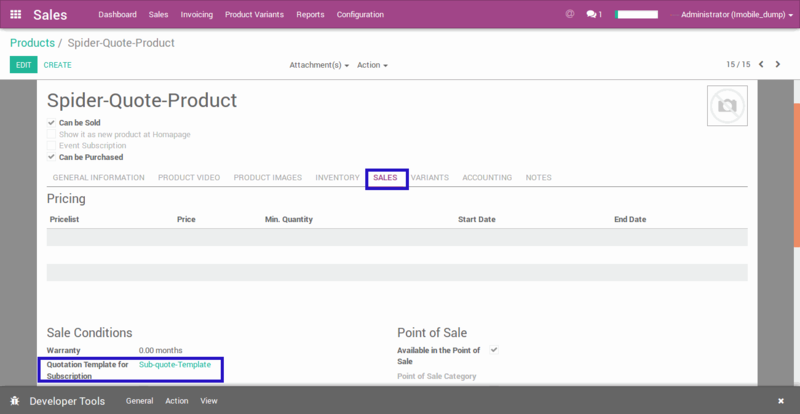 Now make sale product(service) with the given configuration in below images. 7. 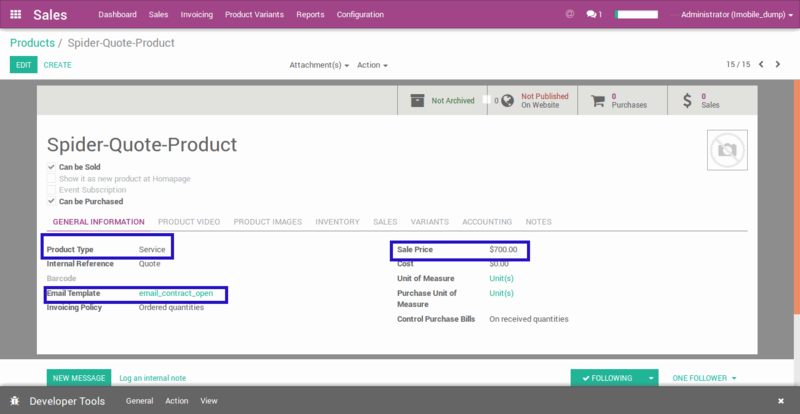 In Product Form , Sales Tab, Assign the Quotation Template for subscription in product as below. 8. 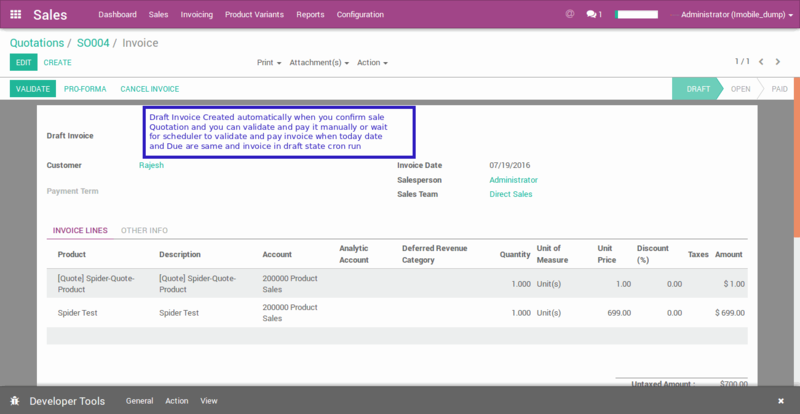 Now Create Quotation with that main product(Example:Spider-Quote-Product ). 9. 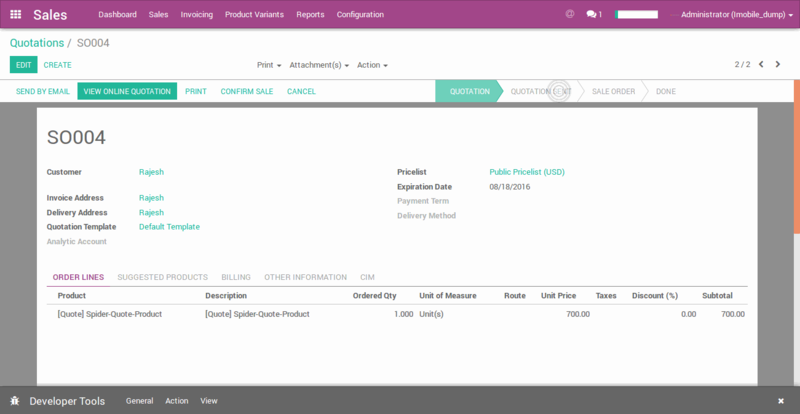 Now confirm that quotation it will create invoice for that and linked sale order to subscription.